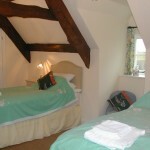 Large Twin Bedroom with very comfortable beds and a private bathroom. 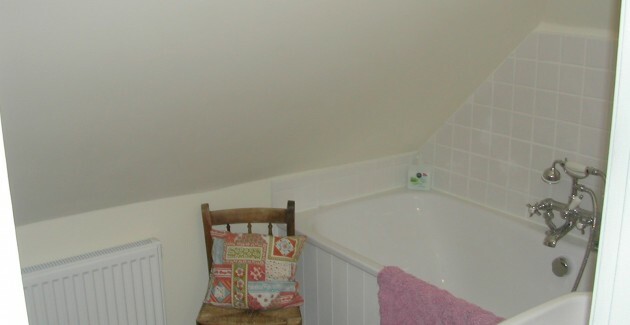 This large twin bedroom is on the top floor of the farmhouse with a private bathroom. 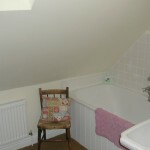 The bath has a shower/mixer tap. 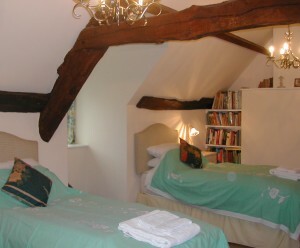 The beds are generous sized single beds with very comfortable firm mattresses. 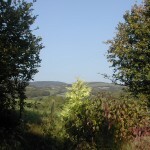 The bedroom has a gabled window with far reaching views of the mountains in the distance and closer to, the surrounding woods, the apiary and fields of Alltybrain Farm. 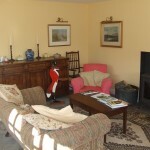 On arrival at Alltybrain Farm, if your arrival time is around tea-time, we offer tea, coffee and home-made cake in the garden room and you are also welcome to use this room in the evenings. 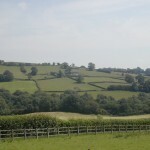 On summer evenings garden furniture will be set up on the terrace and during colder months the wood burning stove will be burning away and making the garden room a snug room to relax in. 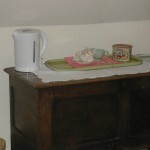 A tea and coffee tray is supplied and breakfast is served between 7.30-9.00am.